4.8.16.10 List on this schedule expenditures from grants received directly or indirectly from state agencies (334). Expenditures from state shared revenues and entitlements (BARS resource codes 335 and 336) do not need to be included on this schedule. 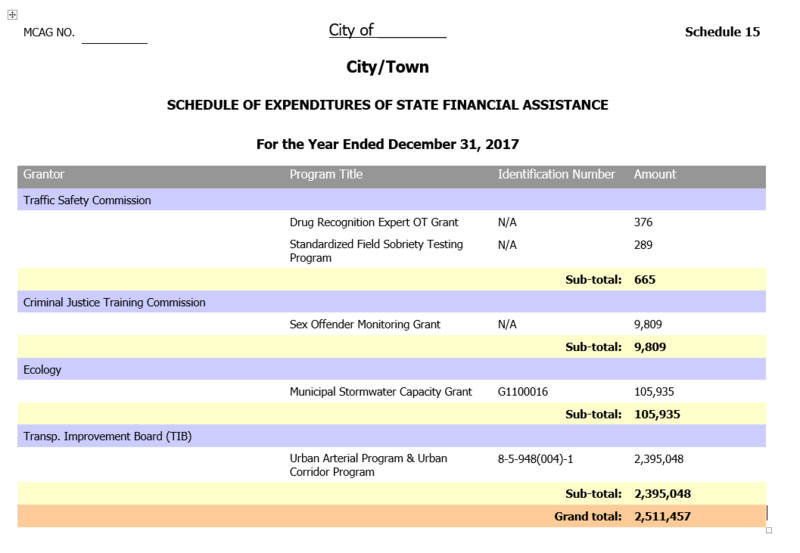 List together all expenditures from grants received from the same state agency. 4.8.16.20 If the government receive state-funded equipment, supplies, or real property, report the fair value in the year received. 4.8.16.30 State-funded loans do not need to be reported on this schedule. Be sure that any loans received from state agencies are not actually federal in origin. In such a case, a federal loan passing through a state agency should be reported in the federal schedule. 4.8.16.40 Any payments that the entity receives as a fee for services in a vendor capacity should not be included on the Schedule 15. 4.8.16.50 Often federal financial assistance received indirectly is a mix of federal or state money. If possible, identify the different sources and list them on appropriate schedules (i.e., the federal share on the Schedule of Expenditures of Federal Awards and the state portion on the Schedule of State Financial Assistance. If the state portion cannot be identified, list the entire amount on the Schedule of Expenditures of Federal Awards and describe the commingled nature of the funds in the notes to the Schedule of Expenditures of Federal Awards. 4.8.16.60 Local governments are required to update the incorrect financial data submitted on this schedule. The requirement applies to all errors found prior or during an audit. Provide the name of the grantor agency. Please clearly distinguish between agencies with similar names or initials. Provide the name of the each program for that agency. Use this column to report grant, contract or award numbers assigned by state agencies. If a number is not available, write NA. Use this column to report current year expenditures (determined on the same basis of accounting as the financial statements). 4.8.16.70 The template for Online Filing is available on SAO’s website page, BARS Reporting Templates. When using the Online Filing option, the system will create the Schedule based on data provided by the local government on the template. See attached example of the final version of the Schedule of State Financial Assistance.